Marinated and rubbed with traditional BBQ seasonings, these light and delicious Chicken Breasts taste like they just came off the grill. With a sweet and slightly smoky flavor they make the perfect entree, sandwich or favorite salad topping. Serve them up with our Roasted Garlic Mashed Potatoes and our Green Beans with Red Peppers and you've got the perfect dinner. Meal serves 4. FROM FROZEN: OVEN: Preheat oven to 400°F. Place desired number of chicken breasts on foil-lined baking sheet. Heat for 12-15 minutes. MICROWAVE: Remove chicken breast from bag. Place one chicken breast in microwave safe dish, cover with paper towel. Heat on high for 2 - 2 ½ minutes. FROM THAWED: THAW AND SERVE: Chicken breasts may be thawed in the refrigerator. Slice and serve cold. MICROWAVE: Remove chicken breast from bag. Place chicken breast in microwave safe dish, cover with paper towel. Heat on high for 1 - 1 ½ minutes. BROIL or GRILL: To warm, preheat broiler or grill. Heat for approximately 3 minutes per side. CONTACT GRILL: Grill for about 2½ - 3 minutes. Do Not Thaw! Microwave (1100-WATT):*Remove cellophane covering Roasted Garlic Mashed Potato tray. Microwave on HIGH for 3-4 minutes. Stir potatoes. Return to microwave and cook for 1 minute. Let rest 1 minute before serving. Oven: Preheat oven to 350°F. Remove cellophane covering Roasted Garlic Mashed Potato tray and place on baking sheet. Bake for 45-50 minutes. Let rest 2 minutes before serving. *Create Parmesan Cheese Roasted Garlic Mashed Potatoes, by sprinkling 1 tablespoon of grated parmesan cheese on each tray of potatoes prior to placing in the oven. 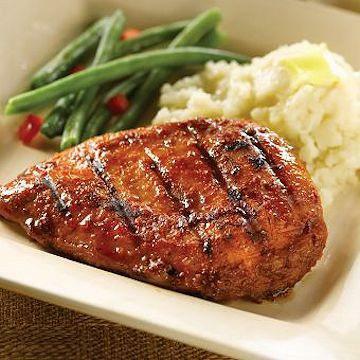 Ingredients: Boneless Skinless Chicken Breast with Rib Meat, Water, Marinade (Sugar, Honey Powder (Refined Syrup, Honey), Worcestershire Powder (Dextrose, Salt, Hydrolyzed Soy and Corn Protein, Citric Acid, Caramel Color, Natural Flavors, Silicon Dioxide), Stabilizer (Tapioca and Rice Starch, Carrageenan), Tomato Powder, Salt, Dehydrated Garlic, Soy Sauce (Soy Sauce Solids (Soybeans, Salt, Wheat), Maltodextrin, Salt), Molasses Powder (Molasses, Maltodextrin, Silicon Dioxide), Spices, Vinegar Powder (Maltrodextrin, Modified Food Starch, Distilled White Vinegar), Paprika, Natural Flavors (including Smoke)). Chile Rub (Paprika, Salt, Brown Sugar, Spices). Contains: Soy, Wheat.